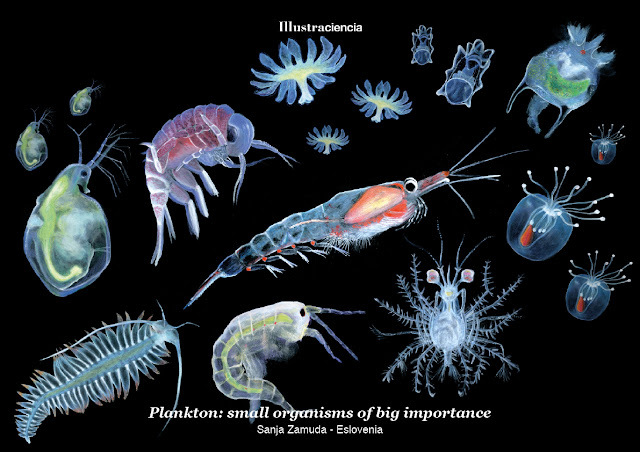 Plankton are a diverse group of marine and freshwater organisms that, because they are either nonmotile or too small and weak, cannot swim against the current and as such exist in a drifting state. The plantlike community of plankton is called phytoplankton, and the animal-like community is known as zooplankton, but we can also roughly subdivide plankton by size into macroplankton, microplankton and nanoplankton. There is also enother division: temporary plankton which consists of planktonic eggs and larvae of animal species and permanent plankton which includes all animals that live their complete life cycles in a floating state. Scientists believe that through photosynthesis phytoplankton contribute between 50 to 85 percent of the oxygen in Earth's atmosphere. According to researches at Canada's Dalhousie University the global population of phytoplankton has fallen about 40 percent since 1950 which translates to an annual drop of about 1 percent of the average plankton population between 1899 and 2008. Phytoplankton population drops 40 percent since 1950, at: Scientific american, http://www.scientificamerican.com/article/phytoplankton-population/, 14 March 2016.